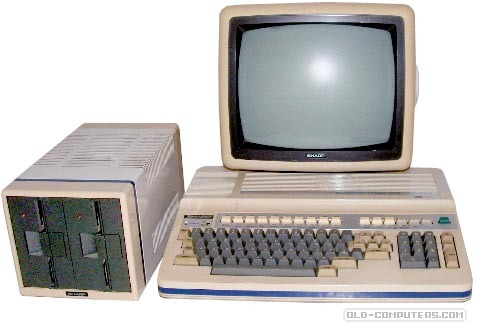 The PC-3201 was an evolution of the PC-3101 model. It was aimed at the small business users. Like the 3101, it was a keyboard unit, but the monochrome monitor was a 12" 80 column version and the dual floppy disc drive unit could store 2 x 142 KB or 2 x 285 KB. Several standard interface cards (RS232, IEEE488, etc.) could be plugged into the main unit. The system offered 32 KB of RAM expandable to 64 KB, and 32 KB of ROM holding the Sharp specific BASIC interpreter. A dot-matrix printer was also sold by Sharp for the 3101 - 3201 series. In fact it was an Epson FX-80 with a specific character generator ROM. PC-3000 series systems were very reliable but, because of a strange price policy from Sharp, they never met success. see more Sharp PC-3201 Ebay auctions !